Rome is a place rich in history and now has a three thousand year old cultural heritage and then to visit all the architectural masterpieces of the Roman one week is not enough. If you visit the city, even for a few days, you can not fail to see the Trevi Fountain, Piazza di Spagna, Colosseum and Roman Forum, to name a few, but the list could go on much longer. The best way to arrange a visit to the archaeological remains and churches on the internet is to consult the official websites of those places to find the opening hours of existing, as much data on the history of the place you want to visit, unofficial Internet sites may be upgraded to the previous year and it is better not to use them for this purpose. The typical Roman cuisine has become famous around the globe, tourists come to Rome not only for architectural masterpieces, but above all to taste some typical dishes of the traditional. For those who want to taste the flavors can try dishes such as”lamb, the spaghetti amatriciana, carbonara or oxtail. Not to be missed during the trip is being hosted a dinner in a typical Roman, where the wine, the food delicious and the atmosphere cheerful and friendly will make you really feel the emotion of living in the eternal city. All these dishes can be tasted Roman trattoria “Taverna dei Quaranta”. As often happens in the Mediterranean countries, dinner in Rome later that the”usual time, and then the nightlife starts later to continue all night. 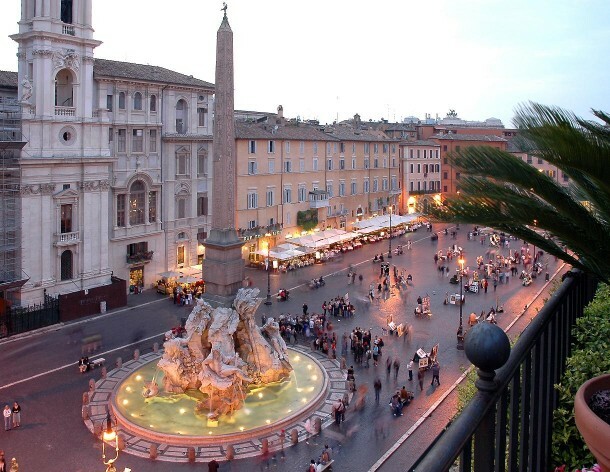 Roma being the largest city in the Italian tourism it provides a vast range of choices, Bed & Breakfast, hostels and rooms for rent very affordable. So there are housing solutions for everyone, just choose what area you want to live in Rome and then look for the type of accommodation you prefer using one of the many booking systems on the internet that many hotels now provide to customers. For those who want to visit the most beautiful architecture without wasting time must be considered that the best you can wish for is to stay near Termini Station, or at least a metro station in (Red). Public transportation is the”ideal for getting around Rome and the”Use of a car is really not recommended, Metro and various buses cover practically the whole Roman, Subscriptions are also lasting a few days, for which you stamp your ticket only once and then you can go anywhere without problems. Rome could be the ideal destination for a holiday, even a few days, is of historic interest for a romantic weekend, discovering the many picturesque views, or for a weekend dedicated to the tasting of typical dishes of Italian and Roman tradition. La Taverna dei Quaranta, popular among restaurants downtown Rome, I therefore invite you to visit this beautiful city and try the typical menu of Roman cuisine.